Whilst spot gold ended yesterday’s trading session marginally higher, silver spot prices closed marginally lower, ending the silver trading session with a narrow spread down candle, but one which found support from the low of the day which bounced off the tightly bunched moving averages, as silver prices continued to trade in a tight range below the $18 per ounce level. Whilst the potential support from below is a positive signal, the potential resistance from above is worrying, and the failure to breach this level is beginning to suggest a technical weakness in this area and a possible reversal in the short term. Gold prices also seem to be running out of steam ( following the steep move higher ) and at some point the gold market will move lower as the market takes a breather, with the silver market following suit and perhaps even leading the way. 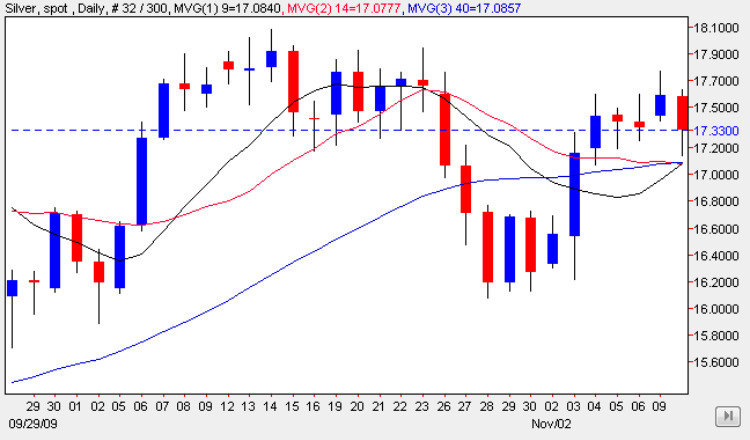 At present there are no clear signals to suggest when this is likely to happen, and whilst yesterday’s candle on the silver chart was a bearish engulfing one, this has to be counterbalanced by the support being provided from below by the bunched moving averages.